Internet lore and science fiction tales suggest that dropping a nuclear weapon on an erupting volcano would halt the eruption. But would that really be the case? Would it just make the eruption worse by opening up more magma tubes? Would it alter the lava flows? Would it send reverberations through the earth's core and crack the world in half (as suggested by the 1965 classic, Crack in the World)? Since no country is likely to drop a nuclear bomb on a volcano in the near future (well, at least Italy and the U.S. didn't take that train of advice with Mount Etna), let's take a look at the possibilities for what might really happen, to the best of our scientific knowledge. Where do we put the nuclear device? I'll present two options for the placement of the nuclear device – 1) the base of the volcano, causing an explosion to give the magma another place to go, and 2) the mouth of the volcano, caving in or sealing off the opening of the volcano, or in a more extreme case, turning the volcano from a pimple on the crust of the earth to a crater. Also, we'll not specify which type of nuclear weapon being used, as an A, H, or neutron bomb should all have the same general characteristics (extreme heat and an air burst) in the early stages, which are what we'll be concerned with. We'll let later generations deal with the radioactive fallout. Magma vs. Nuclear Fission – What Wins? The temperature at the core of the nuclear detonation could be as much as several million degrees Celsius. This temperature would fall off with distance, but would still be over 6000 degrees Celsius dozens of meters away. This temperature would decrease quickly, and be followed by a shock wave. Magma (and once it is exposed to the air, lava), on the other hand, is typically 600 – 1300 degrees Celsius and mainly composed of silicon dioxide, with this also being the approximate temperature at the mouth of a volcano. Silicon dioxide boils at around 4000 degrees Celsius. The nuclear blast should provide a sufficient temperature to boil the magma, vaporizing it along with enough heat to cause a phase transition of the surrounding rock to vaporize it as well. There is a logistical issue with the nuclear detonation, however. One would have to ensure that the fission reaction within the nuclear warhead occurred prior to it coming in contact with the lava, which would likely melt the warhead and the radioactive material inside and prevent a full detonation. Also, a detonation that happens too early and too high above the volcano would only result in an air blast rushing onto the volcano. This delicate timing situation would call for remote detonation, as the surface tension of the lava will doubtfully be considerable enough to initiate detonation. What happens after the initial explosion? So, we probably have enough heat to vaporize a fair amount of the magma and rock making up the volcano. If the nuclear device is placed at the base of the volcano, the first of the two possibilities we'll look at, the heat accompanying the blast and the following air burst would likely bore a hole into the side of the volcano, if only for a moment prior to a cave in, alleviating pressure on the magma chamber. This would allow more magma to flow out afterward. With careful placement, this would prevent an "unplanned" eruption and at the same time causing an eruption in an alternate direction that would be somewhat controlled. If the nuclear device is detonated at the opening of the erupting volcano, the lava and a portion of the protruding side wall would likely be vaporized. This is where the variables come into play. Previous test explosions, like the 1962 Sedan nuclear test (which aimed to use nuclear weapons in large scale earth moving), formed a crater approximately 100 meters deep and 400 meters wide (an image of the crater can be seen above). If the detonation occurred with enough force, it could possibly extend its force down to the magma chamber and "plug" the chamber, halting eruption. However, taking into account the amount of material moved in the Sedan test and comparing it to the height of a volcano (often several thousand meters high), this would seem highly unlikely. A blast at the mouth of the volcano would likely just crush part of the top of the volcano. Even if the blast was strong enough the pressure in the magma chamber would have been alleviated temporarily, but I would think it would be likely return over time, causing another volcanic event. The evil magma just has to get out. While we're on the subject of the uncanny and since I mentioned the idea of cracking the earth in half earlier, the earth's diameter is just too large as well to reach a point where cracking would occur in the later air blast – the depth of blast penetration is not sufficient, and the area underneath the surface of the volcano is substantially magma, which would help distribute the heat from the blast over time. This might work in the case of a small planetoid object or a rock in space with volcanic activity, but the Earth is just too large to crack in two. Either way, I'm not sure you could stop an eruption by using a well-placed nuclear device – you would simply allowing magma to seep forth and go in another direction and hasten an eruption. Both detonation methods, however, could be used for a situation where a controlled eruption was desired, but there are too many unknown variables to sufficiently diagram what would happen in the moments following the initial blast. We've got heat and a blast, but how do we clean this up? And this is the million dollar question. 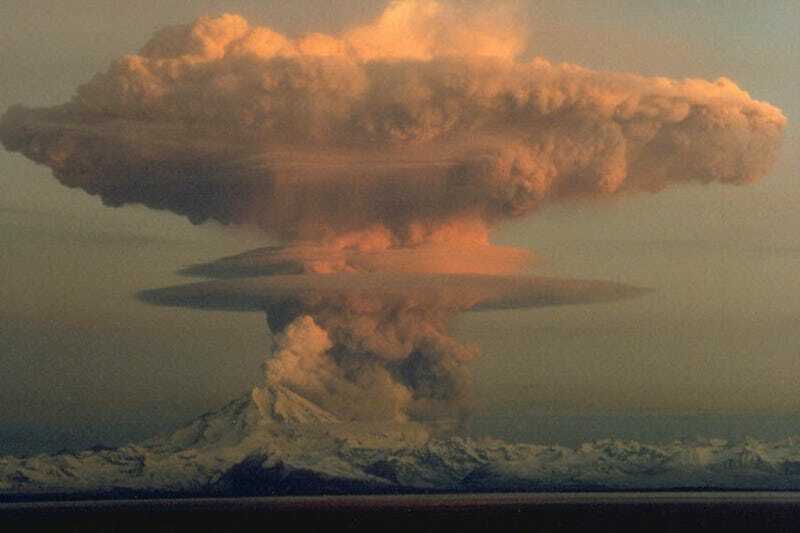 Volcanoes are known to put enough ash into the atmosphere to alter temperatures in parts of the world, and when accompanied by a nuclear blast, there would be considerably more ash, and this time it would be radioactive. This part of the aftermath, in itself, would be reason enough to steer clear of using nuclear devices to halt (if possible) or control an eruption. The accompanying lava flow could also be radioactive, but no one has been crazy enough to try this, so I'd argue that only the leading edge of the post-blast lava flow would be radioactive, as more magma would come to the surface and renew the lava flow. Has anyone bombed a volcano before? Conventional bombs have been used to divert lava flow, as the US Air Force did with flows emanating from the Mauna Loa volcano in Hawaii, sufficiently diverting the lava flow away from the city of Hilo. The results were published as Diversion of lava flows by aerial bombing - lessons from Mauna Loa volcano, Hawaii in 1980. Using convention bombs to disrupt volcanoes in Japan was suggested by a Colgate University Geology professor as a means of hastening the end of WW II as well. The idea hinged on causing a string of eruptions that would devastate Japanese several cities and was published in a 1944 Popular Science article. Nuclear devices don't appear to be an option to halt an eruption, just an option by which to cause an eruption. So, if you want to see someone take a nuclear warhead to the crust of the earth, check out this clip from the 1965 hit, Crack in the World, and be glad we don't make movies like this anymore. Wait, I just said this as a person who went to see Armageddon twice in the theaters and own the Criterion DVD version. Let's just keep nuclear weapons away from volcanoes (even if your intentions are solely humanitarian), ok? Images courtesy of the BBC, Olive Films and the U.S. Geological Survey. Sources are linked within the article.